Sea to Summit Hammock Suspension Straps. Designed to attach directly to Sea to Summit's Hammock's Quick Connect Buckles, these suspension straps make setting up your hammock exceptionally fast. At almost 10 feet long, these straps can wrap around even large trees and are quick and easy to adjust to achieve the ideal 30-degree hang. 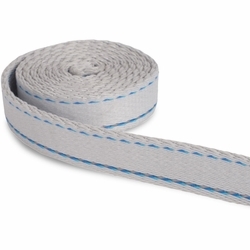 Made of 15mm non-stretch webbing with reflective thread for visibility at night and two high strength steel buckles. Extremely compact, straps can be stowed into the hammock compression sack.